Whether a product release, major company announcement or new brand initiative, it’s easier said than done. Recently, the LPGA Women’s Network and WE ARE GOLF teamed up to do just that by taking on the golf industry question that remains unanswered – how do we get more women to play golf? The #inviteHER campaign stemmed from U.S. female golf participation not being representative of the population. Last year, 24 percent of America’s 24 million golfers were women while the population is about 50 percent. The idea is to encourage current players – men and women – to inspire the females in their lives to get into the game through the power of invitation. Whether it be welcoming her to hit some balls, spend a Friday night at Topgolf or play nine, the goal is to make them feel included. A partner in the campaign, Topgolf will also host a variety of women’s clinics around the launch and throughout the campaign’s longevity to invite women to learn more about the game and gain confidence in their playing abilities. 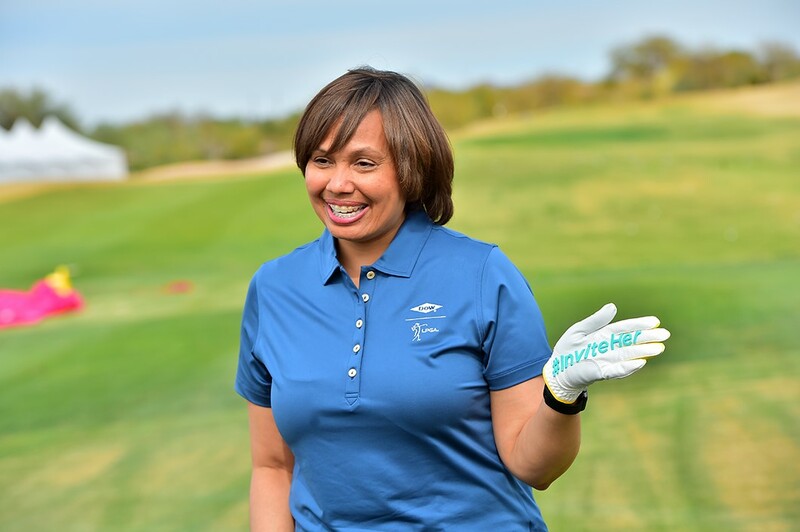 Simultaneously, a wide-variety of golf and lifestyle social media influencers armed with custom #inviteHER gear will be showcasing support for the initiative and promoting the campaign across their networks. We came together as a group to determine the best ways to do this – an all-encompassing marketing plan that includes social media, traditional public relations, experiential events and facility outreach. On August 29, #inviteHER takes the industry by storm, featuring a live announcement on Golf Channel’s Morning Drive and a clinic held by TV personality Paige Mackenzie, but it doesn’t stop there. But how do we make sure the right message is being conveyed across all of these promotions? We helped develop goals of the campaign in many ways. These include crafting clear and concise messages, news releases, a social media toolkit with suggested posts and creative assets for media to easily access and use. To have all these moving parts and team members come together, communication and delegation are keys to success. Producing and implementing detailed project plans are equally important to keep the campaign on time and on budget.